Was May Dugas, the globe-trotting protagonist of Parlor Games, just a sweet girl trying to make good in the big wicked city or was she a glamorously calculating con artist who left a trail of broken hearts and empty wallets everywhere she went? Author Maryka Biaggio offers insights on how a real-life grifter from the Gilded Age sashayed and swindled her way into a succession of romances, not the least of which was with the very person who is suing May at the story’s start. Q: After years in the classroom as a psychology professor, what prompted you to pursue a path of fiction writing back in 2000? A: I’d always wanted to write. Yes, it’s the same old trite story! And I finally came up with an idea and genre—a historical novel about an unknown and possibly shady period of my grandfather’s life. My family didn’t even mind that I threw in a murder to spice things up. Q: Was it easier or harder than you imagined it would be? A: Harder. Writing fiction is the most difficult task I’ve ever undertaken. By comparison my dissertation was a snap, getting tenured at three different universities a waltz, and paying off a mortgage in 16 years easy-peasy. Q: Who are some of the published authors whose work you admire and whose style may have influenced your own creative approach to storytelling? A: Barry Unsworth is one of my favorite historical novelists. He had a way of telling a profoundly moral story without sounding the least bit preachy. I also love the work of Geraldine Brooks, E.L. Doctorow, and Marilynne Robinson. Erik Larson has a marvelous knack for making nonfiction read like fiction. And Valerie Martin’s taut story-telling deserves more notice. Being a writer has “ruined” reading for me in a way—I’m always standing back and examining how writers manage the magic. But I still love to read, and when a book really transports me and I lose sight of how it happened, I admire it all the more. M.L. Stedman’s The Light Between Oceans was the last book that I completely lost myself in. 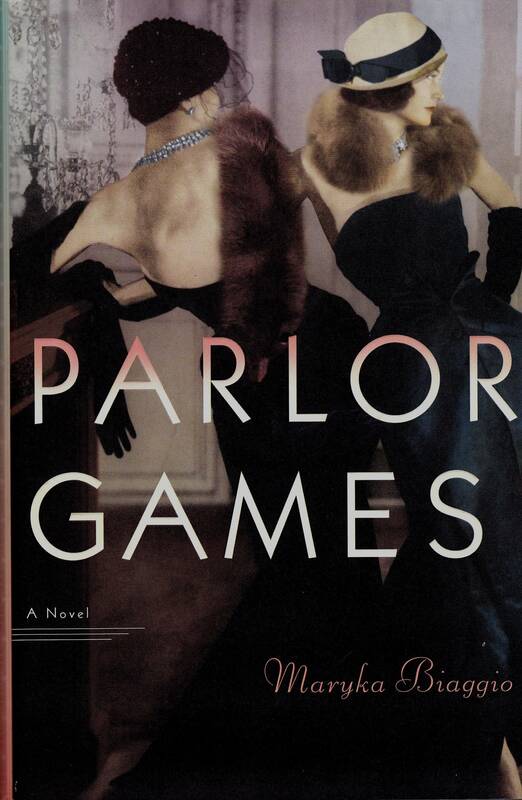 Q: You have three novels that you wrote prior to Parlor Games. What were they about and what did the completion of each one teach you about the craft of writing? A: Those three novels haven’t found their way off my office shelf. I queried agents and I pitched them at conferences but I couldn’t drum up a publisher. They’re all historical novels. The first is the story of a young man trying to uncover the truth about his grandfather’s life (see first question), the second is based on an actual utopian community founded in the Upper Peninsula of Michigan in the 1890s, and the third is a bit more modern. It’s the story (again true) of a talented young woman who rejects her family’s wealth and runs away to New York in the 1960s to become an actress. She lands some good roles, but then she becomes obsessed with an opera star and her life unravels. With each novel I uncovered more and more lessons in what I didn’t know. Writing fiction is like becoming a musician: You must practice—for long hours, for many years, and attune your ear to detect both the screechy and tuneful notes. Q: So tell us what ignited your fascination with the real-life May and her deliciously scandalous reputation. A: On a lark I stopped at the Menominee Information Center back in summer of 2009 during a family vacation. There in a glass case I spied a document (as it turns out, a Chicago Tribune article), the first line of which read, “The Pinkertons had her down in their files as the most dangerous woman in the world.” This writer couldn’t resist the urge to make May provide an account of her life. That’s why the novel is told in first person. Q: Had all of your research been collected and organized prior to starting the book or were you looking up things as you went along? A: I researched as I wrote. I tracked down newspaper reports of the trial early on, and I wrote all those scenes first. Then I started on May’s life story, digging up the dirt as I moseyed along. Q: The storyline artfully cuts back and forth between May’s “present-day” trial in 1917 and the three decades preceding it. What governed the decision to use intercuts rather than a purely linear progression of events? A: I feared chapter after chapter about a trial would slow the action too much. And I liked the idea of referring to events in the trial and then hinting at them in the history shortly afterward. I hoped that would keep the reader interested in both the trial and May’s life story. Q: You have a wonderful quote on your author page by William Martin that says, “The historian serves the truth of his subject. The novelist serves the truth of his tale.” How much creative license did you employ in managing all of the moving parts of May’s colorful escapades? A: I learned the broad outlines of May’s adventurous life through research, and I tried to stay true to these events (or at least the historical accounts of them, which were sometimes inconsistent). Creative license came into play as I tried to build conversations and the day-to-day events behind the escapades. I would spend weeks trying to figure out how she managed a particular con. She had much more talent in that department than I do! A: Kathy Bates—what an inspired choice! I’d love to see Marion Cotillard play May. She has the striking features, hauntingly mysterious manner, and French flare that make her perfect for the role. I picture Harry Connick, Jr., playing Detective Dougherty. Q: From a psychological perspective, would you categorize May as the sympathetic victim of a chauvinistic era or as a sly opportunist who would have engaged in criminal activity regardless of her circumstances? A: I think of May as a woman with great ambition and an adventurous spirit. During the Gilded Age women’s roles were quite circumscribed, and she simply didn’t want to settle for mundane marriage, not even one that brought wealth with it. She wanted to travel the world, mingle with the rich and famous, and see how far she could push a con. Today she’d probably be CEO of some wildly successful corporation. Or an international jewel thief. Q: Do your characters ever surprise you? A: Yes, and that is one of the most delightful experiences of the writing process. Sometimes when I’m drafting a scene I close my eyes and just let my fingers fly over the keyboard. Some of the dialogue that has popped into my head when I give the characters free rein does surprise. Q: If May’s philosophy of life were printed on a t-shirt, what would it say? Q: Had the Pinkertons not been her constant nemesis, with whom do you think May would have found the most happiness? A: I think May was downright disarmed by Johnny, the young man she met in Tokyo. He was unlike most of her other “companions.” He was trusting and fun-loving, and he believed she was just who she said she was. She hated having to leave him—but she chose to do that rather than shatter his innocent spirit by revealing her scandalous background. Q: I love the inclusion of “Parlor Talk” on your website in which your society-savvy protagonist dispenses advice to the lovelorn. Is this an interaction you plan to continue? A: I hadn’t planned on it but if any damsels in distress need May’s assistance, I’m sure she’d be glad to share her wisdom. Q: So many book clubs these days are utilizing the technology of Skype to invite authors into their living room meetings. How has this worked out for you and what do readers need to know in order to book you for a virtual appearance? A: I’ve done both face-to-face and Skype book club visits. Both are great fun. The live visits afford more opportunity for mingling and special twists. For one group we recreated the dinner May shared with Claude Montcrief (p. 32). Skype sessions tend to be more focused and “on topic,” which makes for good in-depth discussion. Readers can contact me through my website (www.marykabiaggio.com), and I will gladly schedule an appearance with their book club. A: I’m making good progress on another historical novel based on a real person—Barbara Follett, daughter of famous literary critic Wilson Follett. She was a child writer prodigy educated at home by her mother Helen Follett, who was also a writer. At the age of 12 Barbara published her first novel to critical acclaim. Then tragedy struck the family. Q: What did you as a writer hope to accomplish with Parlor Games? A: I aimed to entertain! Author’s P.S. : And indeed she did!